Thought for the day: Many students find it easier to notice than to wonder. If they are doing more of one thing than the other, encourage them to try to balance it out. I notice segments and dots of different thicknesses. I notice a dot at every place that the segments intersect. I notice that the dots make arrays. I wonder why the dots are different sizes. I notice that the number of each group of segments (3, 2, and 4) matches a digit. I notice that 32's digits match with vertical segments, and 4's digit matches with horizontal segments. I notice that there are 12 large dots and 8 small dots. I notice that the product of 32 and 4 is 128. I notice that the number of large dots (12) matches the number of tens in the answer, and the number of small dots (8) matches the number of ones in the answer (128). I wonder why the number of dots shows something about the answer. I wonder if this kind of picture works for simpler (1-digit by 1-digit) multiplication. I wonder if this kind of picture can help me find the answer to every multiplication problem. I wonder if a 2-digit by 2-digit problem would include thick horizontal segments. I wonder how I could show hundreds with the segments. I wonder if I could use pictures like this for decimal multiplication. Create a diagram for 4 x 23, and compare it to the one in the prompt. Create diagrams for 1-digit by 1-digit multiplication problems. Create diagrams for the 2-digit by 1-digit problems. Create diagrams for problems that have numbers in the hundreds or thousands. Create diagrams for problems that have decimal place values. Whenever they create a new diagram, students should look for patterns and explain how the diagrams show the answers. I notice that light segments represent ones, and thick segments represent tens. I notice that thin segments meet with thin segments in a small dot. I notice that thick segments meet with thin segments in a larger dot. I wonder if thick segments would intersect with think segments in even larger dots. I wonder if I could let the segments stand for any place values I choose. 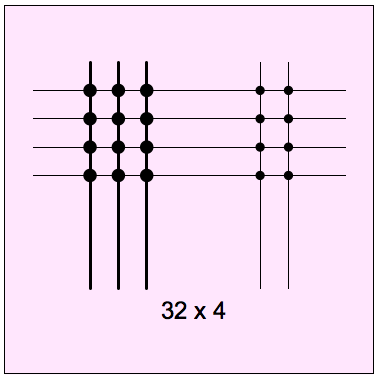 I notice that when I draw a diagram for 2-digit by 2-digit multiplication, there are two arrays of large (tens) dots. I wonder if these diagrams can help me think of (new) strategies for multiplying multi-digit numbers. You can learn more about using this type of image with decimals in Exploration 6: Visualizing Decimal Multiplication from my book, Advanced Common Core Math Explorations: Numbers and Operations.